In Korea Pojangmacha means ‘tented’ or ‘covered’ wagon/cart, so it actually means all the plastic and tarpaulin covered food carts, as well as what many of us call soju tents when they show up in Kdramas. The ones serving soju appear after it gets dark, and disappear again before daybreak. Many are operated illegally and the Korean Government has been cracking down on them, calling them ‘unsanitary and eyesores’. Fortunately for us the Seoul City Government has finally recognized that they are a ‘cultural presence’ within the city and have recently stated granting permits to some. Nevertheless there are far fewer than there used to be. With their origins beginning just after the ending of the Japanese occupation of Korea in 1945 they quickly became ‘the place for commonfolk and salarymen to go to relieve the stresses of life’. Not fancy, or made with comfort in mind, just a place to be anonymous and to eat and drink the stress away. It was ok to go and drink alone, or in companionable silence, to grab a quick bite before the long commute home, or to meet up with old friends. 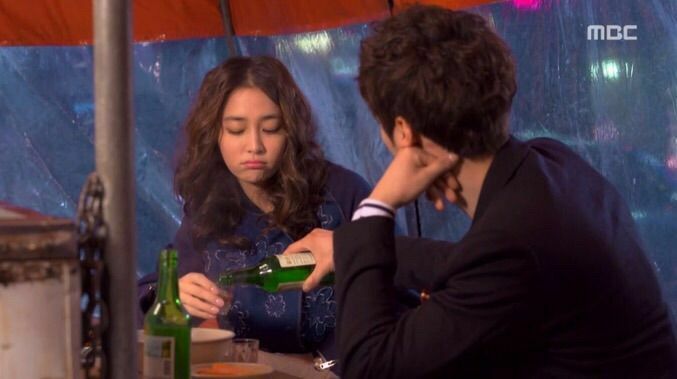 In Kdramas they are also the place to get over heartbreaks, to spill secrets, drink away disappointments, and to get drunk enough for the hero to piggyback the heroine home. Our soju tent experience happened by chance and turned into one of the highlights of our trip. We were actually looking for a restaurant for dinner, but as anyone who has been to a 24 hour food street in Seoul can tell you the number of choices is somewhat overwhelming. Instead we saw a line of 3 soju tents at a busy intersection and randomly chose the first one after the crosswalk. It was early so there were only a couple of people inside. After some confusion with us not knowing you had to order ‘anju’, food that goes well with alcohol, before you could order the soju, we sat down on little plastic stools. The owner spoke zero English, but tried his best to help us order, which was tricky as he only sold seafood, most of which we didn’t recognize, and that was still alive in baggies filled with water. We played safe and ordered mussels, and the owner kindly offered to take our photos. Then luck, fate, or serendipity, whatever you call her stepped in in the form of three people who turned our whole evening into one of the best ever. Wanting to practice her English Hyelyn came over to chat with us, and then after a little while invited us over to their table. Food and drink and conversation happened, with a lot of miming and laughing as we tried to overcome the language barrier. The evening progressed with us not noticing the passing of time. Being the youngest, my daughter was ‘encouraged’ to try everything, however I was given the choice. I did try a couple of things which I probably would never choose to eat again, but everyone just thought it was funny watching my expressions. In the second photo you can see the walls starting to come down, we were there so long the owner was closing shop around us. Some of what was left. All that could be seen during the daylight hours. There was no piggyback ride home, but there was a bit of staggering, as we had been in the soju tent for hours, but we had a great night and met some wonderful people who I’m now proud to call friends. I can’t say this would happen to everyone, but I can say it is worth trying a soju tent even though it looks a little intimidating. Just remember go to the bathroom first, be polite, say annyeonghaseyo when you enter, and ‘read’ the tent. If it is older single men it is probably a ‘local’ and a group of loud tourists might not really be welcome. Look for a busy one with a mix of different people in it. Check to see what kind of food is available, ours was only seafood, and remember the food isn’t cheap. It is about what you would pay in a restaurant. There have been some tourist complaints about soju tents so if you are worried try one with a city permit, or ask the people at the local tourist office. You may also enjoy A Look at Hongdae, Seoul: Megacity, Foodie’s Delight: The Street Food Of Korea, My Favorite Place To Stay In Seoul, and A Walk Down KStar Road. Photo credits to original owners. (2 – 6) Rest to Elle Marzec. ← Foodie’s Delight: The Street Food Of Korea.